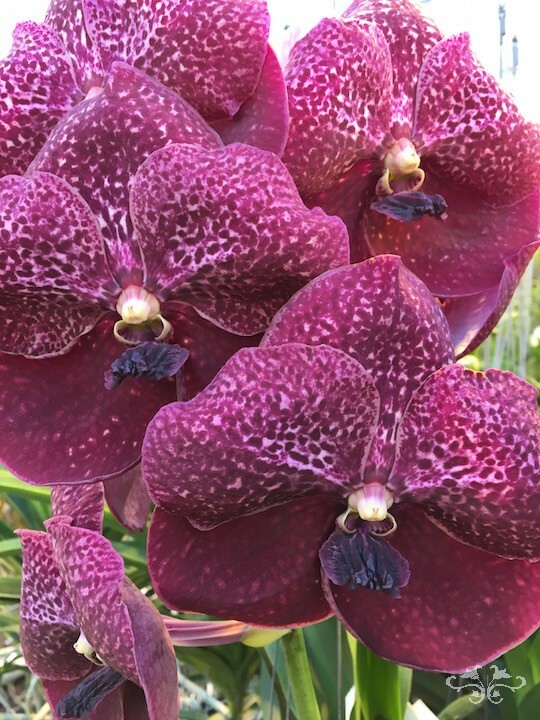 I have always been fascinated by Orchids... for their history and exciting stories of 19th and early 20th century Orchid-hunting in dangerous lands; for their unique qualities which make them unlike other flowers and plants and, of course, for their incredibly luxurious beauty. 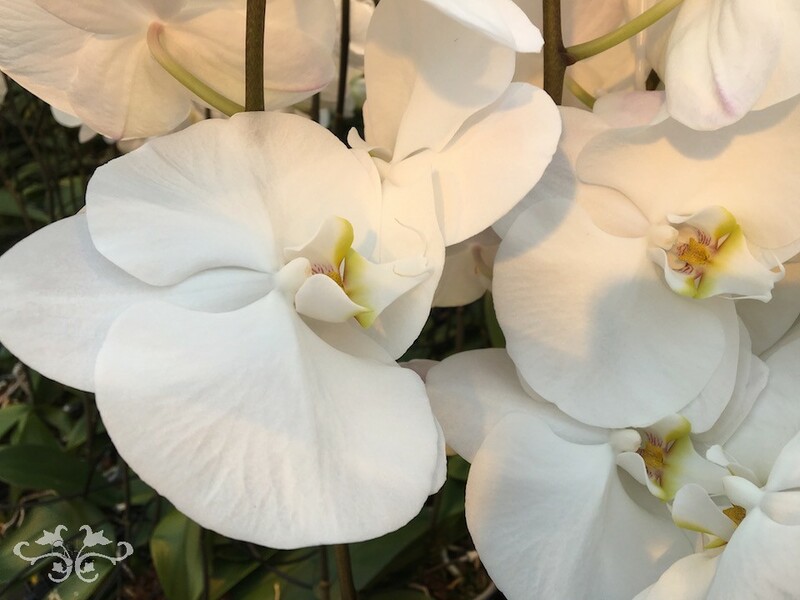 So you won't be surprised to hear that we feature a lot of Orchids at Neill Strain Floral Couture, in our signature bouquets, plants for home styling, and as the opulent flower for our luxury weddings and events. Each year, in celebration of the Chelsea Flower Show and in collaboration with Chelsea Fringe, we host a floral festival in our Belgravia boutique. 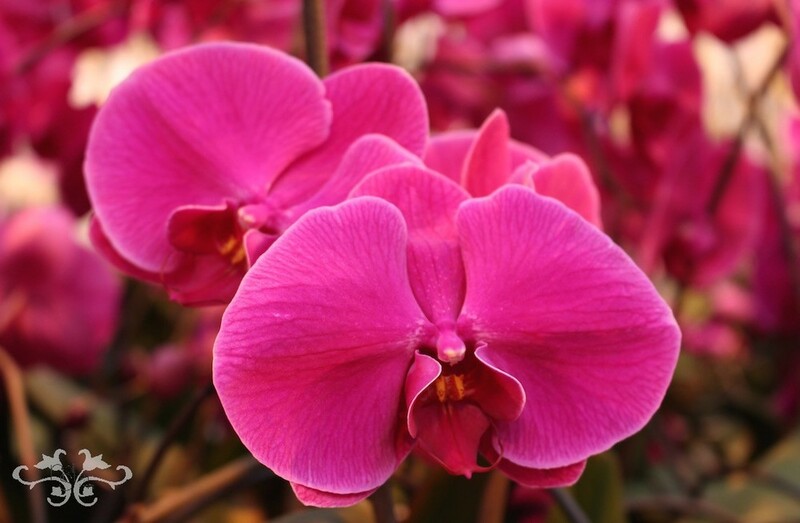 Following Tulips, Peonies and Roses in past years, the 2016 display will focus on Orchids, in particular Phalaenopsis and Vanda Orchids. 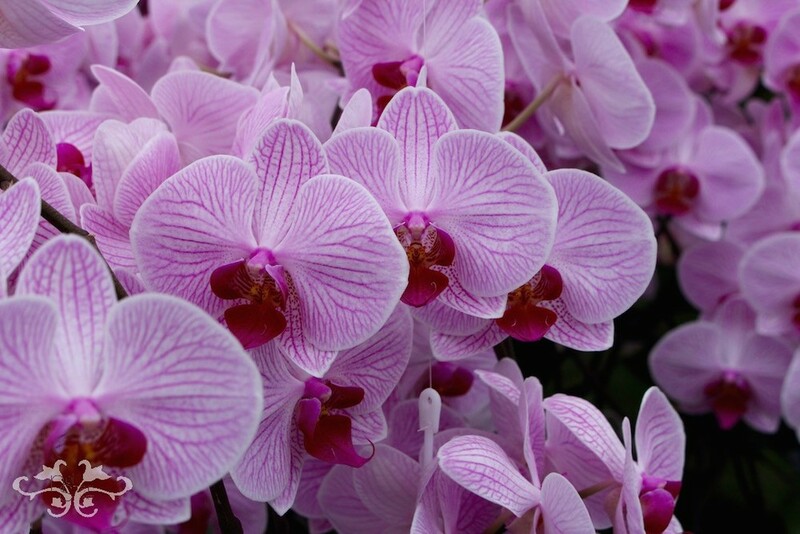 What caused the 19th century Orchid-fever? 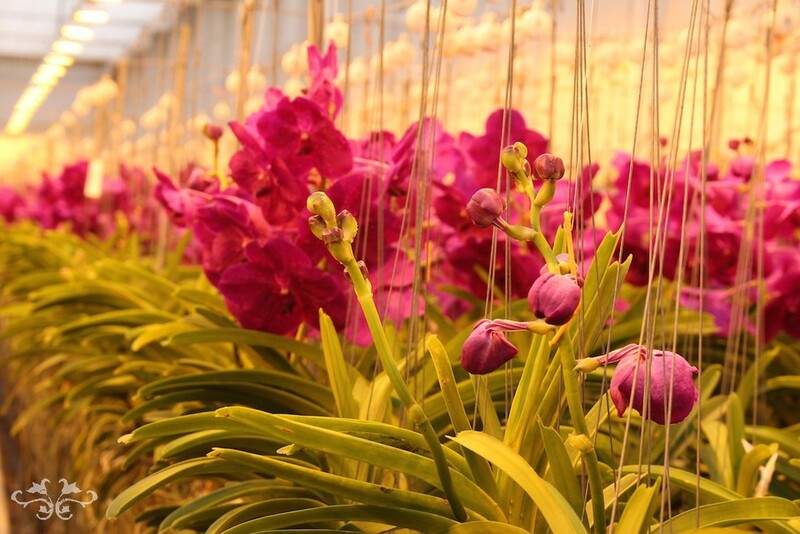 Why were men willing to risk their lives in the search of new Orchid varieties in far-away, dangerous lands? 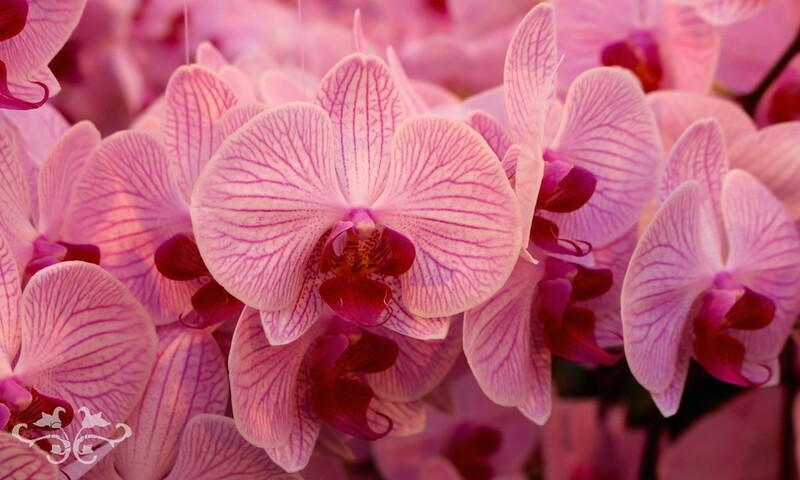 Why were Orchids so rare and so sought after? It is believed that in 1818 a box of tropical plants including some Cattleya Orchids were sent from Rio de Janeiro to London by William John Swainson. One of the Cattleya bloomed during the journey and it's unusual form, colour and exceptional beauty triggered the "Orchid-fever." 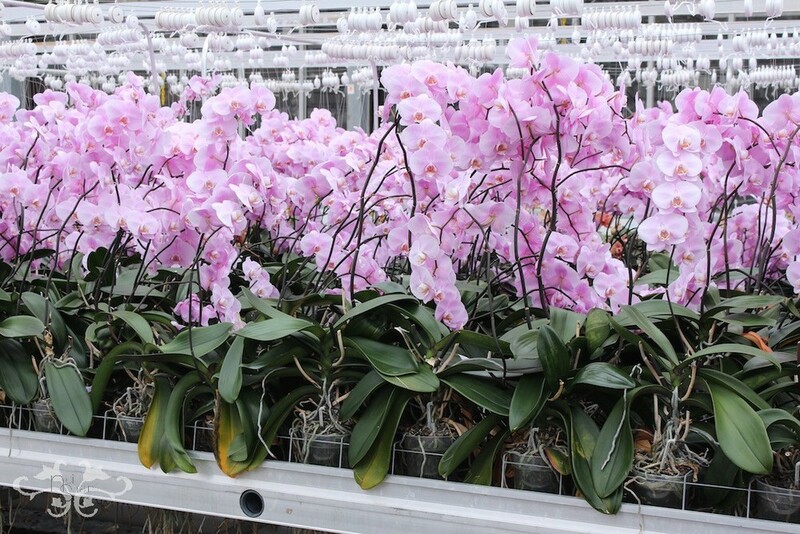 Demand and prices grew rapidly alongside the rarity and difficulty of obtaining new Orchid varieties. Most plants could not survive the long ocean-journey to London and furthermore, they were impossible to reproduce from seed until 1905 when Noel Bernard discovered that the seeds needed contact with a particular fungi to allow germination and food supply. 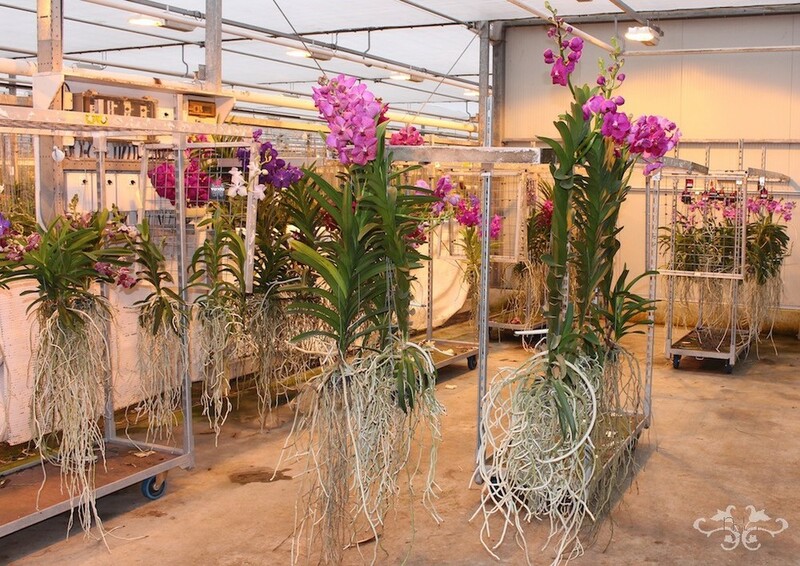 Orchid-hunters, with the prospect of high financial rewards, travelled the Far East, Central and South America under life-threatening conditions in search of new varieties. 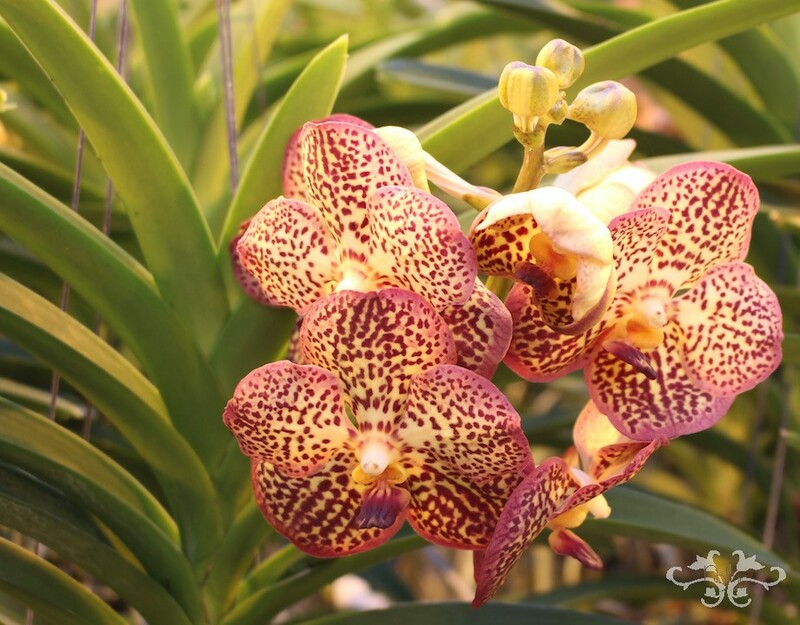 They faced deathly diseases, wild animals, poisonous snakes, floods, the barbaric violence of some natives and even fierce competition from fellow Orchid-hunters. Very few survived and those who did returned as heros with incredible stories. 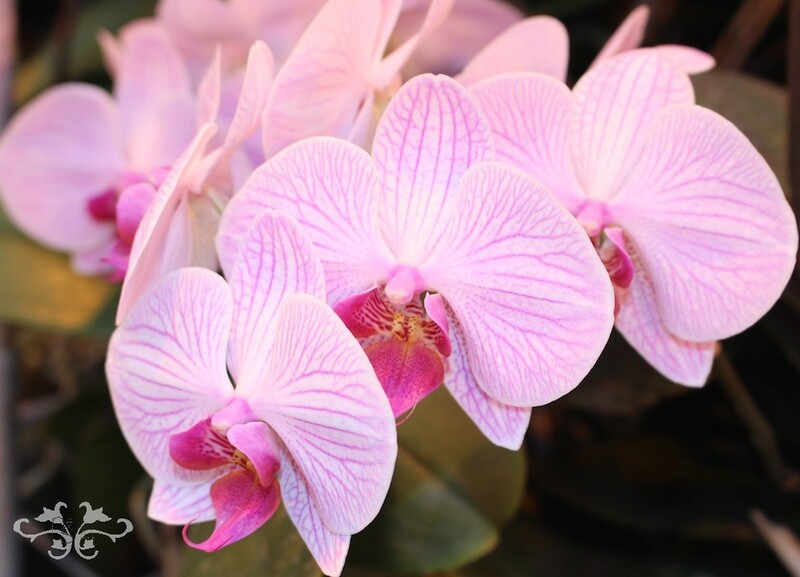 Orchids, the family of "Orchidaceae," are one of the oldest and largest flowering plant varieties dating back to 100 million years ago! 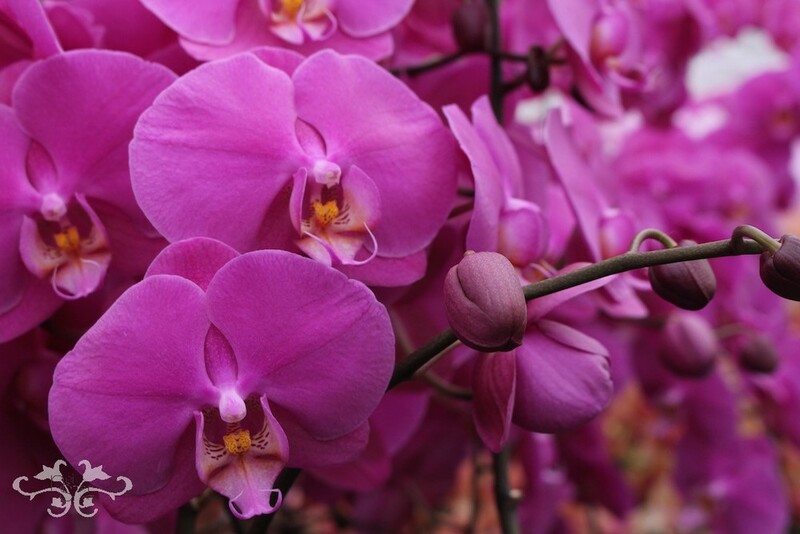 The Orchidaceae comprises about 27,800 currently accepted species. They grow all over the world, including the Arctic circle, although they are most abundant in the Tropics. They have some unique characteristics such as the bilateral symmetry of the flowers and microscopic small seeds. 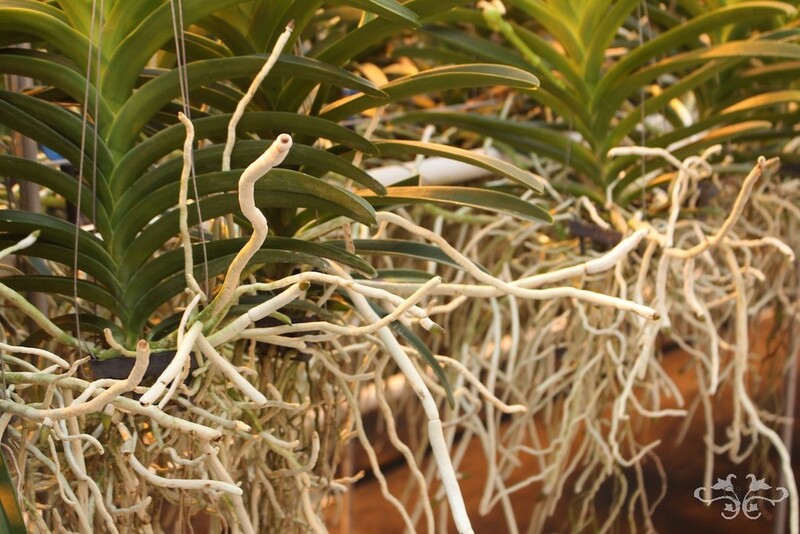 While some Orchid varieties have rhizomes or tubers and grow in the ground, Phalaenopsis and Vanda Orchids are "epiphyte" and have modified aerial roots, sometimes over a meter long. In nature they grow high up on trees or even rocks with their roots exposed to the air. They are not parasites. They just use the trees for moisture and to attach themselves closer to the sunlight. 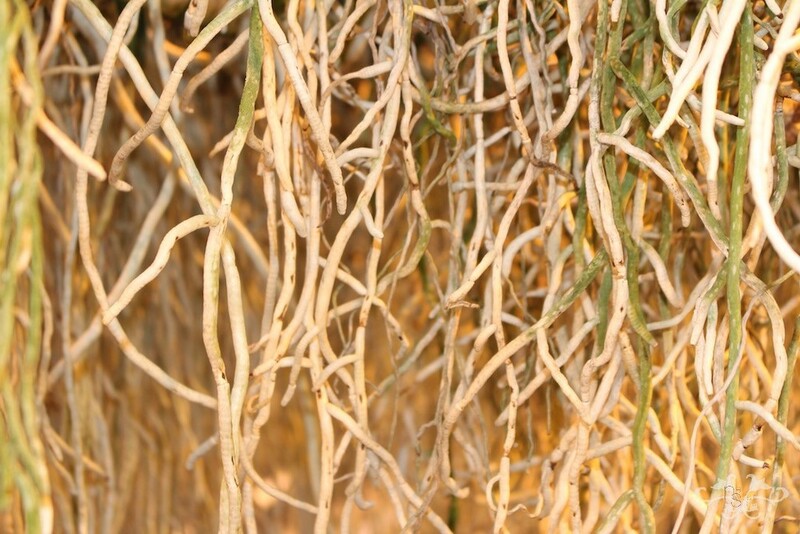 See these Vanda roots below. 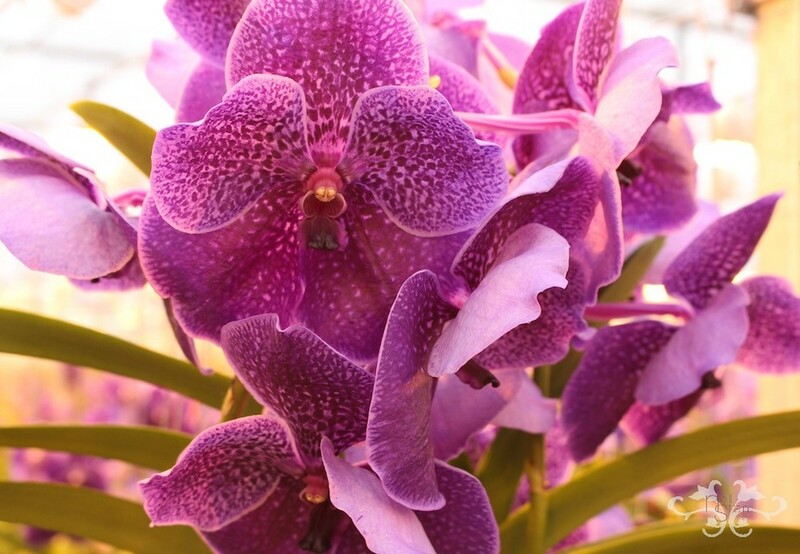 The leaves of Vanda Orchids are perennial and grow alternately with each bloom so you can easily see the age of the plant. The one I'm holding is obviously very old and very tall! 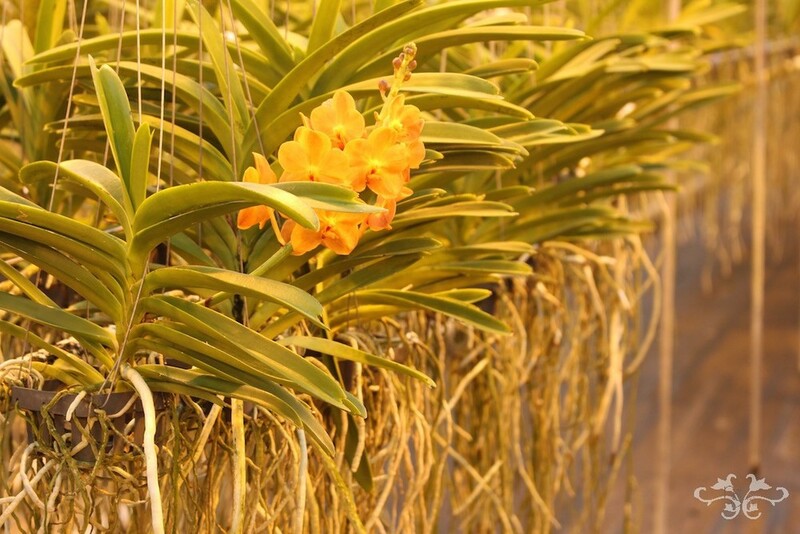 The pollination of Orchids is complex, difficult and scarce. 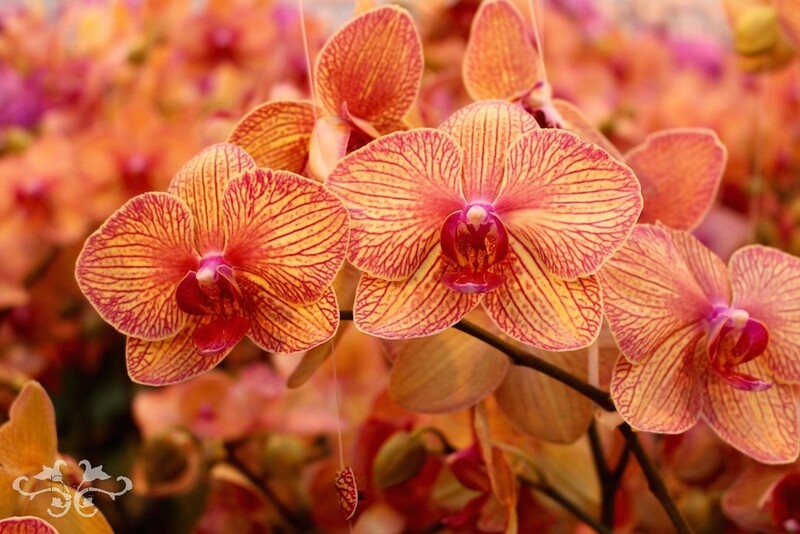 Hence, Orchid flowers need extra time (compared to other flowers) to enable pollination and are therefore very long-lasting. 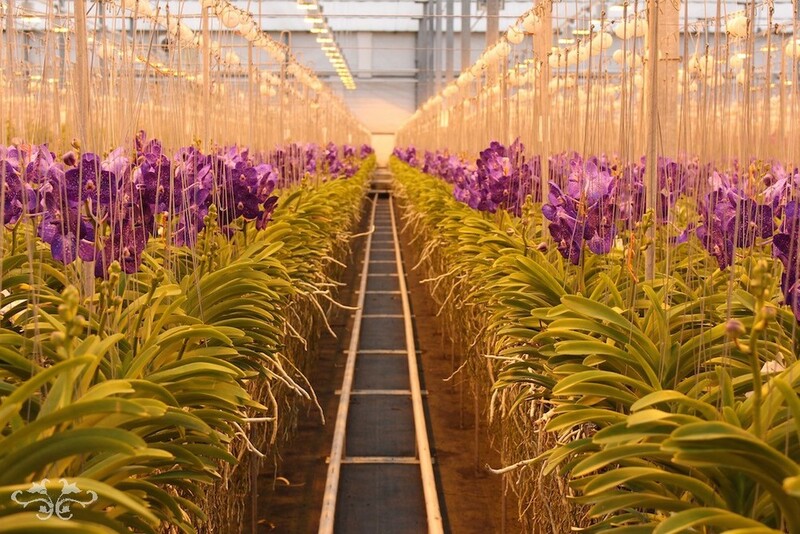 This also explains why our cultivated Orchid plants make wonderfully, long-lasting cut flowers and flowering house plants. 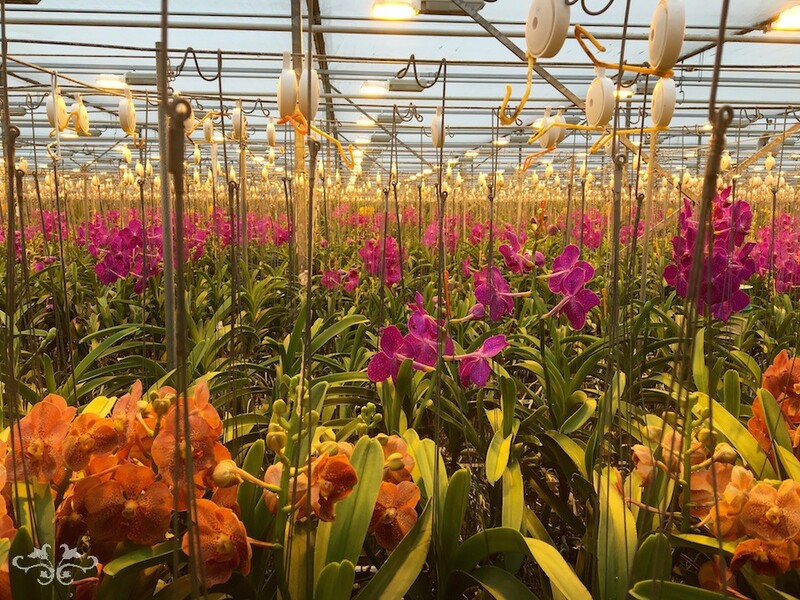 During my recent sourcing visit to Holland, I visited many Orchid growers in order to research the theme for this year's Chelsea Flower Show. 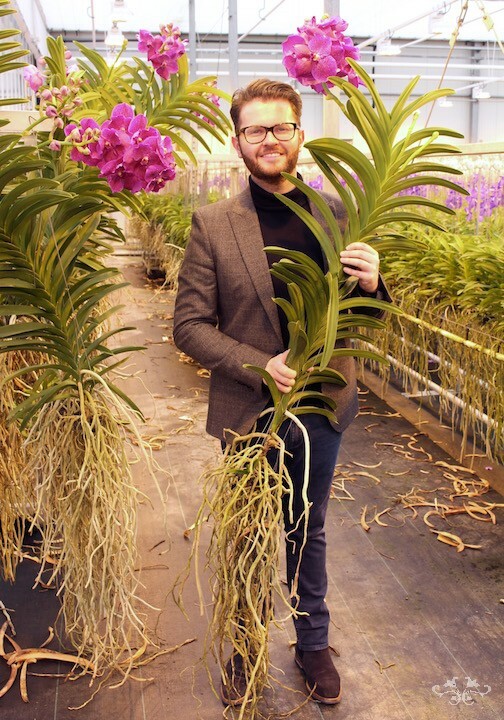 I was absolutely stunned by both ANCO, the famous grower of Vanda Orchids and Ichtus Flowers, the largest and most diverse grower of Phalaenopsis. 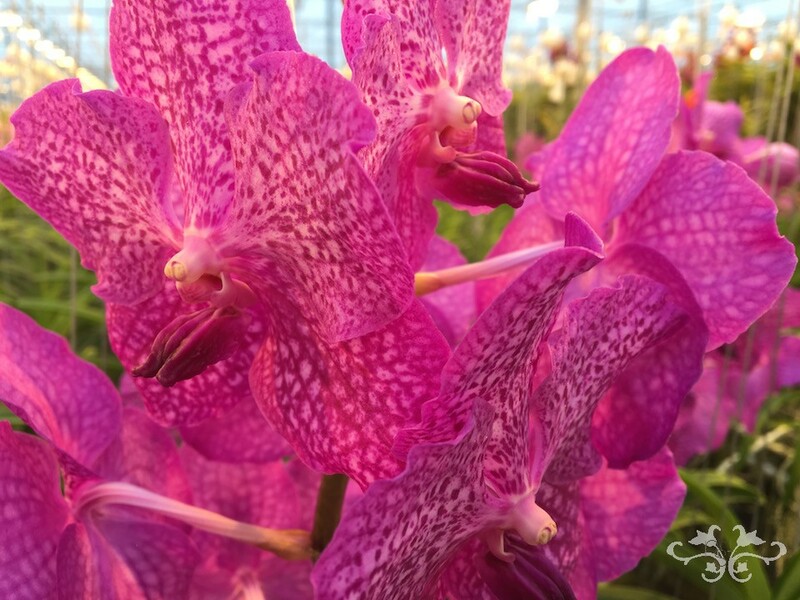 Steef van Adrichem discovered Vanda Orchids by accident in Thailand 20 years ago. 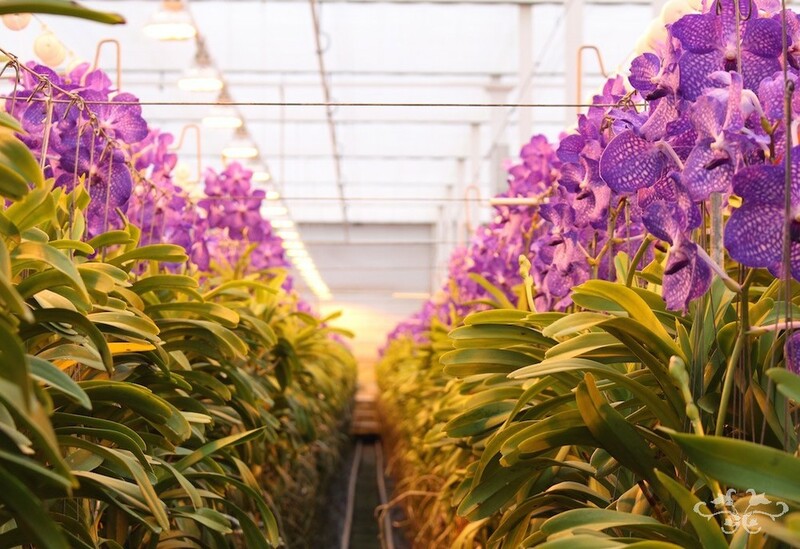 The extraordinary characteristics of this Orchid brought him to create ANCO Pure Vandas which, today, boasts over 60,000 square meters of glasshouse dedicated exclusively to 700,000 Vanda plants. 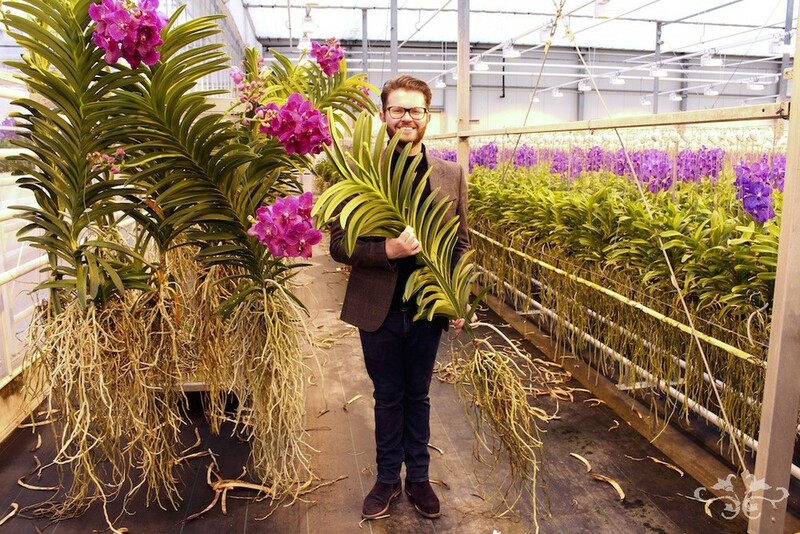 Over the years, Steef has virtually single handedly introduced Europe and the west to Vandas. As a cut flower they last several weeks; even out of water they can last several days; they don't bruise; they are gloriously beautiful and now exist in almost every colour imaginable. Since 2010, Steef has a partner, Ed Helderman, and the company continues to expand. 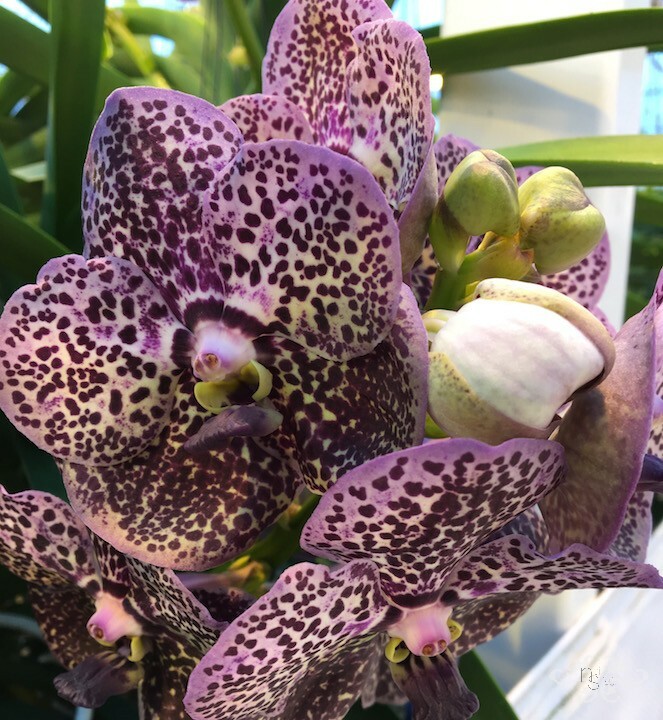 ANCO now has 7 different 'families' of Vanda Orchids, available to florists as plants (in an assortment of vases), by the stem, by single flowers or in a bridal kit "The Living Jewel" for buttonholes and diadems. 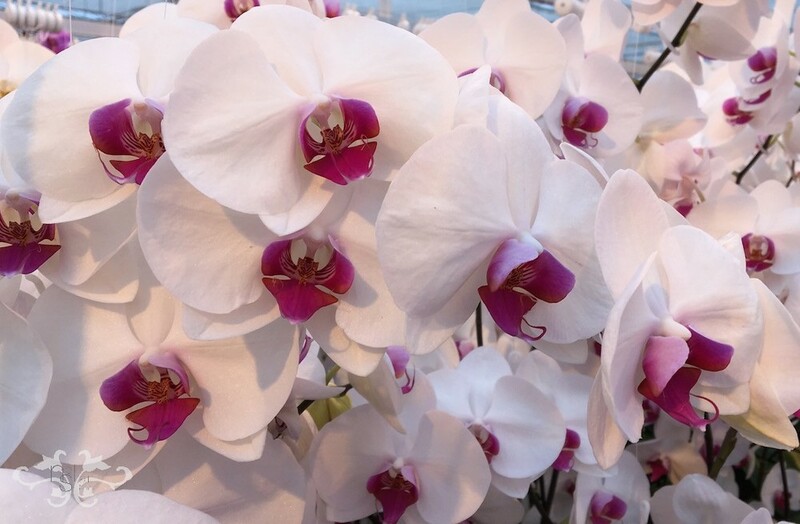 White Vanda Orchids are a dream for weddings... they don't bruise and they remain in perfect condition out of water for buttonholes and corsages. Acres and acres of enchanting Vandas... the best way to get around is on a bicycle. 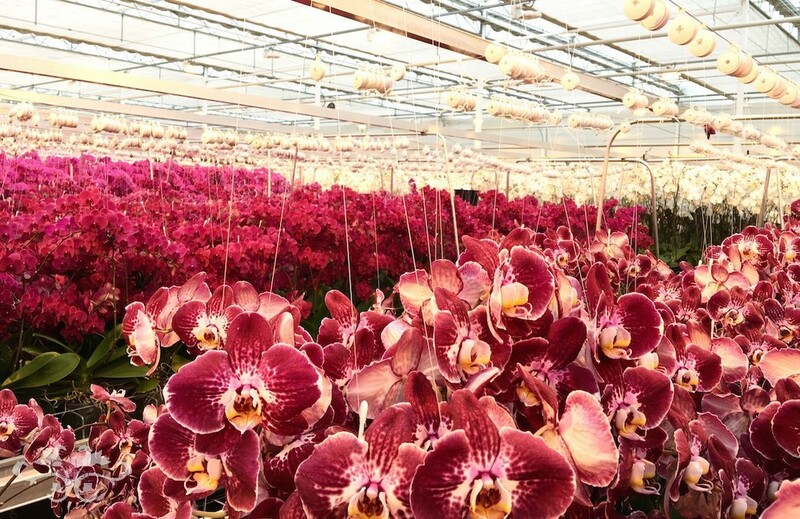 Ichtus Flowers is the largest of only 4 cut Phalaenopsis growers in Holland and produce the widest range of varieties (14). 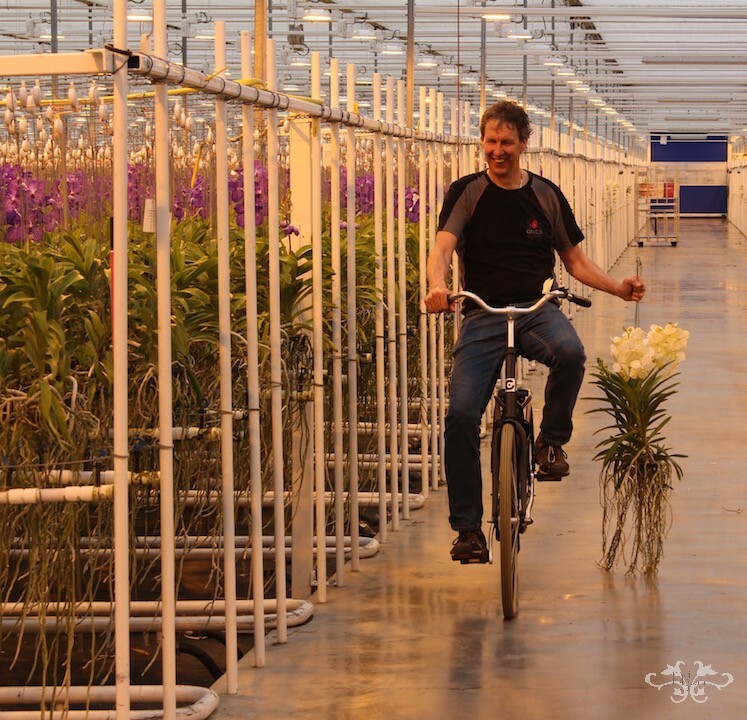 The company was founded in 1995 by Danier vd Spek for the production of cut Anthuriums. 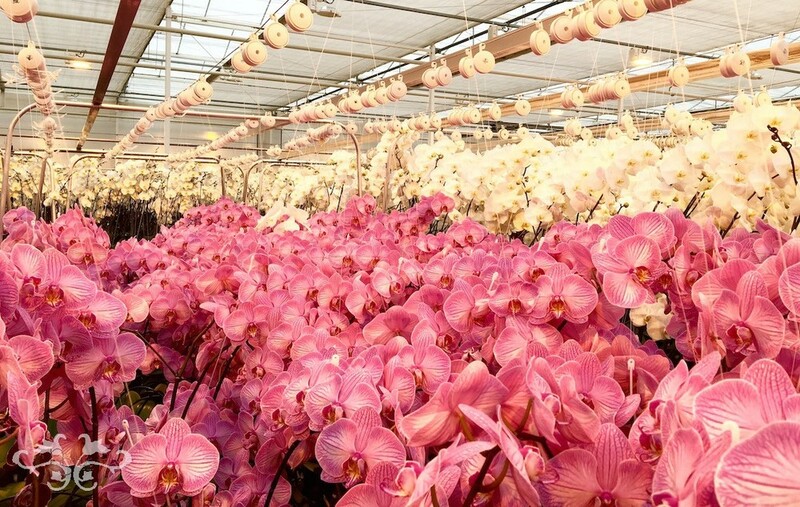 Today, Danier has 2 partners, Bas Boevee and his son-in-law Pieter Lips, together with new premises covering 4 1/2 acres of glasshouse of which 2 1/2 acres are dedicated to cut Phalaenopsis. 500,000 plants produce 10 million flower heads per year. The remaining 2 acres are devoted to Anthurium pot plants. Ichtus is equipped with the latest technology and techniques to guarantee the highest quality; temperature controlled areas for each phase of production, transportable tables, etc. so that the multiple stems are strong, very long and the flowers in perfect condition. It takes 18 weeks for all the heads on one stem to open and be ready for picking. 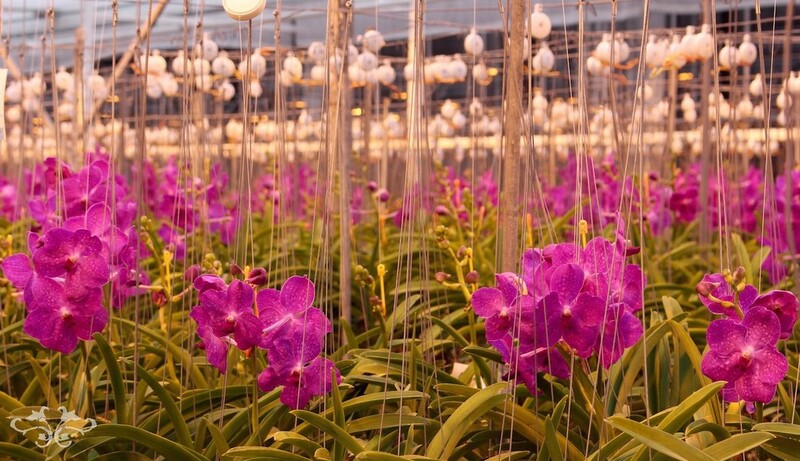 Ichtus Flowers produces 10 million Phalaenopsis flower heads per year, all in exceptional condition. As you can imagine, my sourcing visits to Holland are exhilarating. 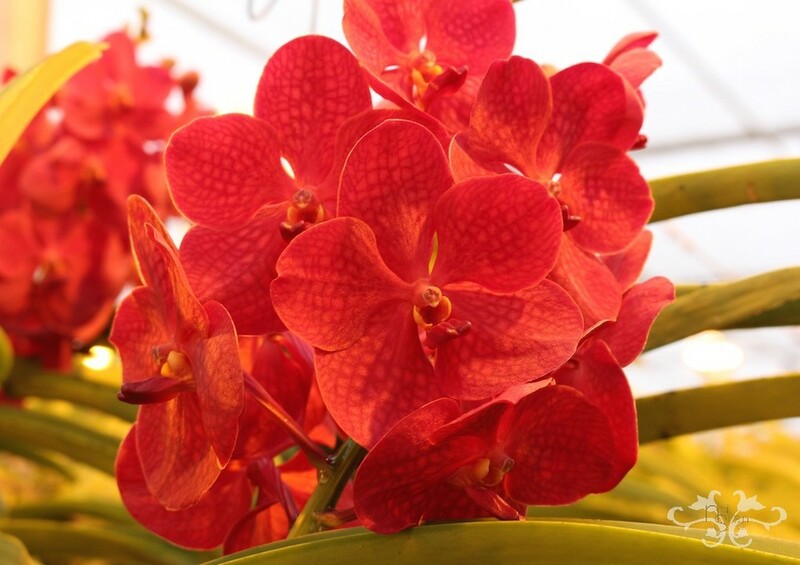 Standing amongst so many exquisite flowers is an extraordinary experience! 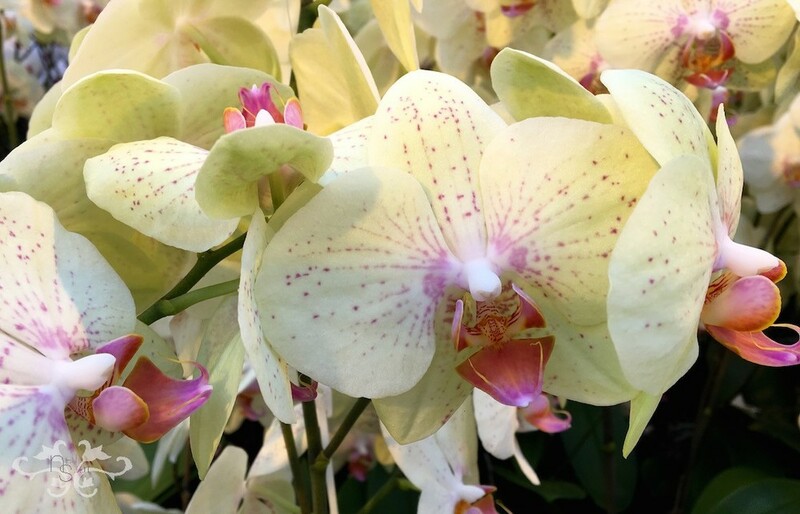 And now we're eager to share this with you... a wild selection of rare and exotic Orchids fit for the Orchid-hunters themselves will be showcased at our boutique, The Flower Lounge, during the Chelsea Flower Show. Monday, May 23, 11 am to 4 pm and Tuesday, May 24 to Friday, May 27, 12 noon to 7 pm at 11 West Halkin Street in Belgravia. 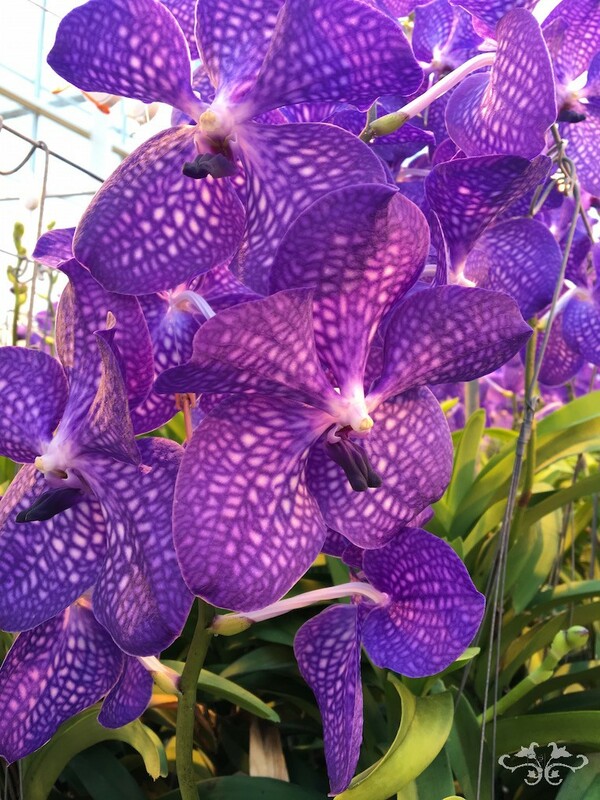 Details also available at Chelsea Fringe: http://www.chelseafringe.com/event/for-the-love-of-orchids-3/2016-05-24/ or give us a call on: 020 7235 6469.